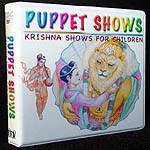 Classic Hare Krishna childrens television programs. Puppet shows and cartoons. All based on the strories found in Srila Prabhuapda's translations of the Srimad Bhagavatam and the Sri Caitanya caritamrta. AJAMILA leaves a saintly life for sense gratification, but the results of his service are not lost when, on his death bed, he desperately calls for his son, Narayana, whom he named after the Supreme Lord. DHRUVA MAHARAJA goes to perform austerities for a worldly kingdom and gets far more than he expected. A FISH IS JUST A FISH is a humorous analogy of the essential conflict of the soul in this material world. HARIDASA THAKURA AND THE PROSTITUTE offers a valuable lesson in the life of Lord Caitanya's devotee Haridasa. And in AGHASURA, Krishna saves the cowherd boys from a gigantic demon snake Color 97 minutes. JADA BHARATA is a devotee of the Lord who falls prey to thieves and is rescued by the goddess Kali. KING CITRAKETU loses a son in this morally instructive story, but learns that the soul can never die. MADHAVENDRA PURI finds a long lost deity of Krishna in the forest. GOVARDHANA HILL shows how worshiping God directly is better than worshiping the demigods. SANATANA GOSWAMI is a high ranking government official who becomes one of Lord Caitanya's dearest disciples. The Ungrateful Man. Color 60 minutes.